Sandro Rodrigues, aka Digital Amerindio, released in 2013 his 1st and only album “Intensos Animais Imperceptíveis” after a series of homemade recordings. The album was originally released via Brazilian label Cloud Chapel as a 10-track streaming and homemade CDR. Now it’s being re-released to streaming through midsummer madness. “Intensos Animais Imperceptíveis” (translates to Intense Imperceptible Animals) was the celebration of years of partnerships between several friends from the countless bands that Sandro had been playing as a drummer since 1991. The lonely process of home recording songs resulted in three EPs, originally released by Bonifrate‘s blog-label Shroom Records. When Sandro was invited to play an important show in 2012, he decided it was time to gather some friends. Recruiting was fruitful: calling themselves Mouse Mouse Joe, Digital Ameríndio grouped with Löis Lancaster (from Brazilian freak-music Zumbi do Mato), Pedro Bonifrate (from Brazilian psychedelic trailblazer Supercordas and now solo), Robson Riva and maestro Gabriel Ares. Productive rehearsals led to the album being created. It features special guests Chinese Cookie Poets in the song “Janela”. 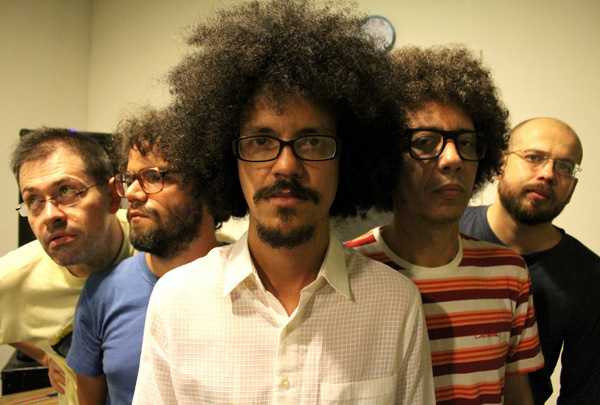 When the album was out, in 2013, Sandro had to move to the northern Brazilian State of Maranhão, leaving the project in halt. Cloud Chapel, the label, also folded. “Intensos Animais Imperceptíveis” became a hidden treasure. Five years later, the psychedelic-lo-fi-soul album is again available. Sandro plans to reunite the band, despite geographical distances. Bonifrate left Mouse Mouse Joe amicably to concentrate on being a father and to dedicate to his solo music.”To return from Maranhão in 2018, a year of difficult political disarray, and try to put everything together again is proving extremely hard. Any plan in Brazil will need dialogue with an unpromising political-cultural reality that seems to be settling here“, wrote Sandro via email.